As soon as you sink your teeth into a Daniel Thaiger burger, and the juices pour into your mouth, you’ll know why they have gained such a burger following in Bangkok: their beef is amazing! 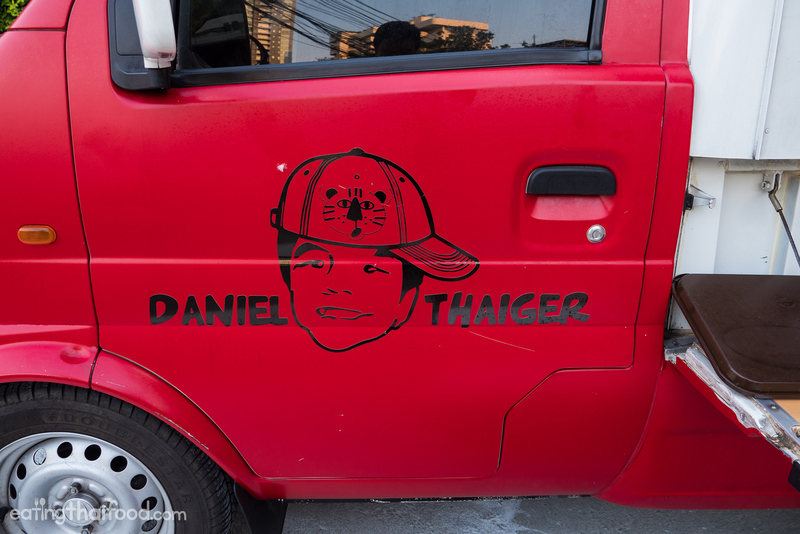 Daniel Thaiger, the signature red food truck, is one of the pioneers in Bangkok when it comes to gourmet food trucks and burgers. And while there are now many restaurants that offer burgers throughout the city, Daniel Thaiger still makes one of the absolute best burgers you’ll find in Bangkok. 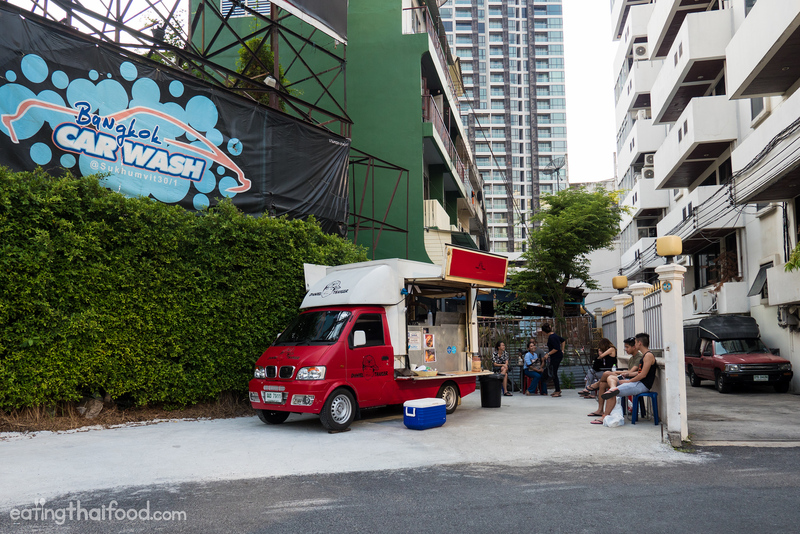 In addition to the thousands of portable Thai street food carts all over Bangkok, there are also a growing number of food trucks. Dwight and I were sitting in his office, hot and hungry one afternoon, and we started talking about burgers. Burgers are something I don’t have a chance to eat very often, but the more we talked about eating a burger, we both felt that it was mandatory to go eat a burger – there was no holding us back. 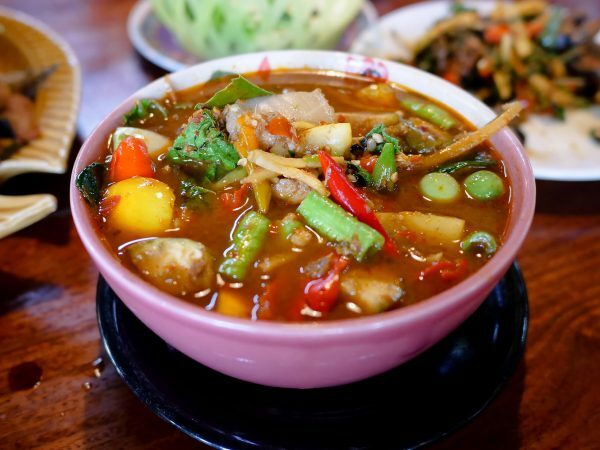 The original location of Daniel Thaiger was located along Sukhumvit Soi 38, a former Bangkok street food street which has unfortunately since been reclaimed by its land owners and the street food carts have all had to depart. 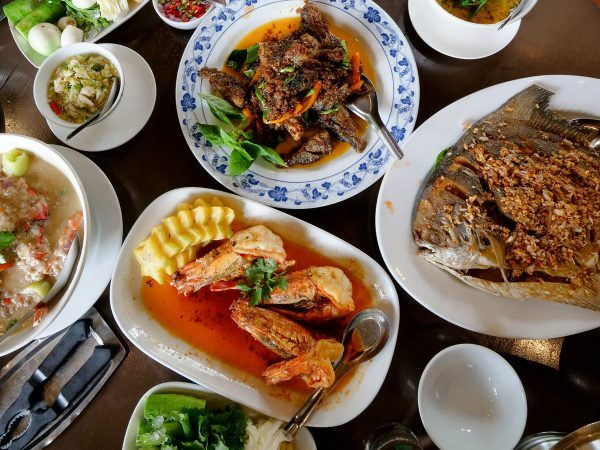 Daniel Thaiger has been positioned in a number of locations since, but the good news is, as of May 2016, Daniel Thaiger has a new permanent location on Sukhumvit Soi 30/1 (which is right in between Thong Lo and Phrom Phong BTS stations), right behind the Philippines Embassy. What I like about the menu at Daniel Thaiger is that it’s big enough to make a few choices, yet it’s not big enough to make you confused and have to deal with the paradox of choice; there are just the right amount of choices. The Thaiger, Mr. Steve, Cowboy, and Sumo Oat are all pre-filled burger choices, but in reality, you can really build your own burger with the toppings you like. They are more than willing to accommodate whatever your preference is for your burger. I decided to go with the Mr. Steve, and I made the decision to get add an extra patty. One of the things that Daniel Thaiger emphasizes, and that you’ll immediately be able to acknowledge and recognize when you sink your teeth into their burger, is the quality of their beef, which is always fresh and never frozen. Also, you can choose how you want your burger cooked. I went with medium rare, and it was perfect. 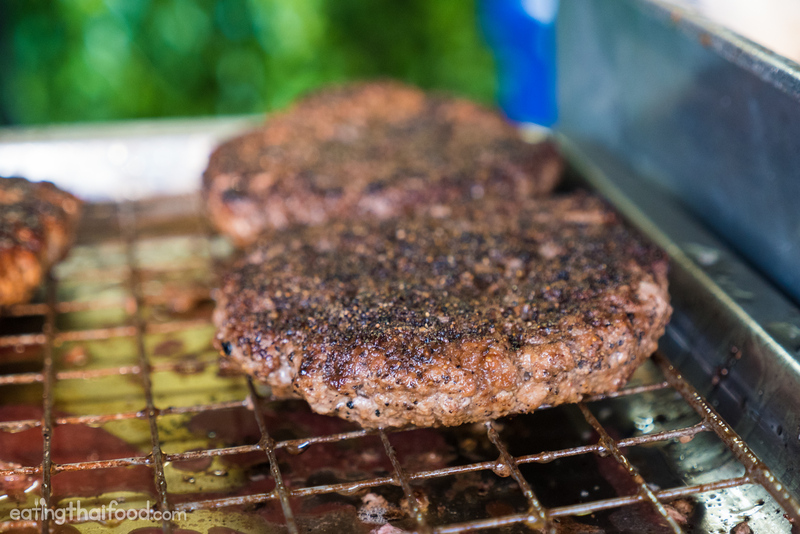 For the burgers, they season the patty with both salt and pepper, and as they are sizzling on the griddle, they are doused in a bit of Worcestershire sauce. You can also order the mustard burger patty, which I didn’t try this time, but next time I probably will. From what I heard, up until recently, fries were not even on the menu at Daniel Thaiger as they chose to focus exclusively on perfecting their burgers. But you can now order fries. 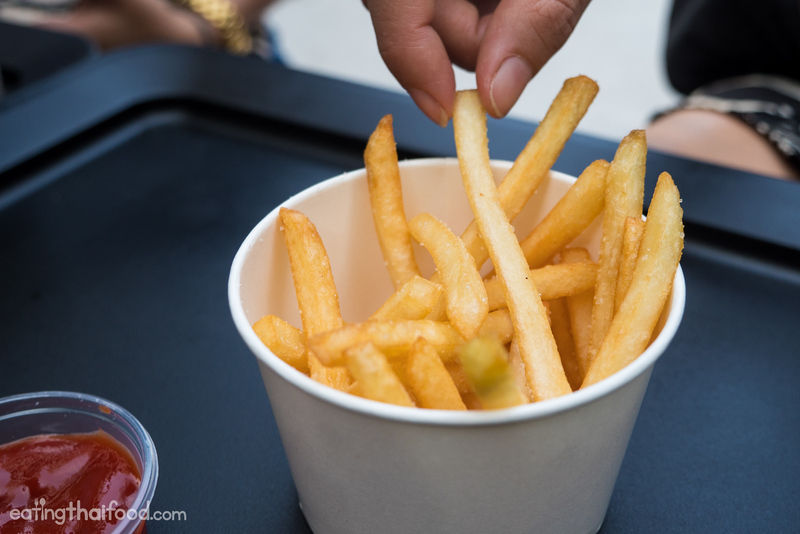 While the burgers were sizzling away, we snacked on some fries to help keep our mouths from watering too much from the aroma of those burgers. The fries were decent, of the thin cut variety, and nice and crispy. Another type of fries that I think Daniel Thaiger was testing out when Dwight and I ate there, were their animal style fries (I think they might not be on the menu, but you can ask for them if you’d like). 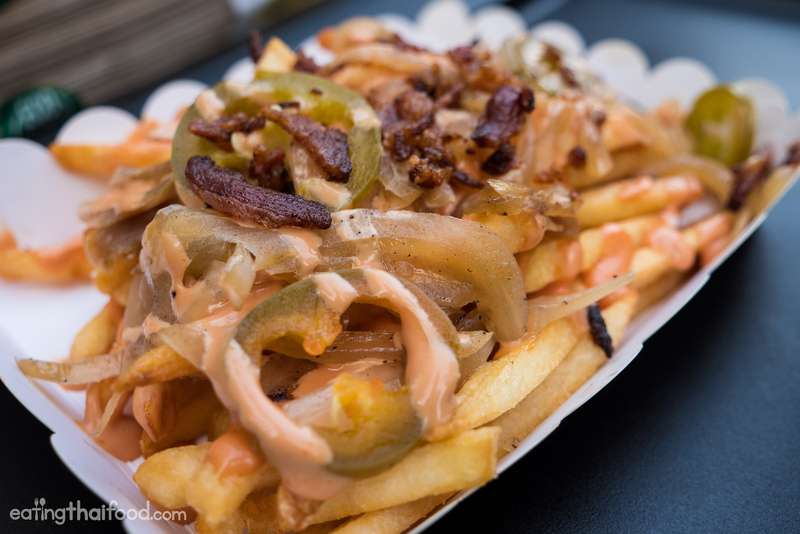 Under the influence of In-N-Out’s famous secret menu, these fries were smothered in a similar mixture of toppings that included fried onions, jalapeños, bacon pieces, and lots of tangy thousand island style (yet their own version) creamy dressing. They were were pretty good. There’s nothing we could do from licking our fingers and the plate clean. The Mr. Steve is a pretty classic dressed burger, including a brioche bun, bacon, cheese, beef patty, grilled onions, tomatoes, lettuce, and finally finished off with some Thaiger sauce. I ordered the double patty, so they stuck the cheese right in-between the two juicy burgers. It was all about the beef! For the bun, they use a brioche bun, and it’s grilled just to the point of being slightly crispy and fragrant but still fluffy and soft. As soon as I pressed my fingers into the bun, I could feel how soft it was. The bun also had a wonderful buttery shimmer and taste to it. The bun was fantastic. The insides of my Mr. Steve – that beef! 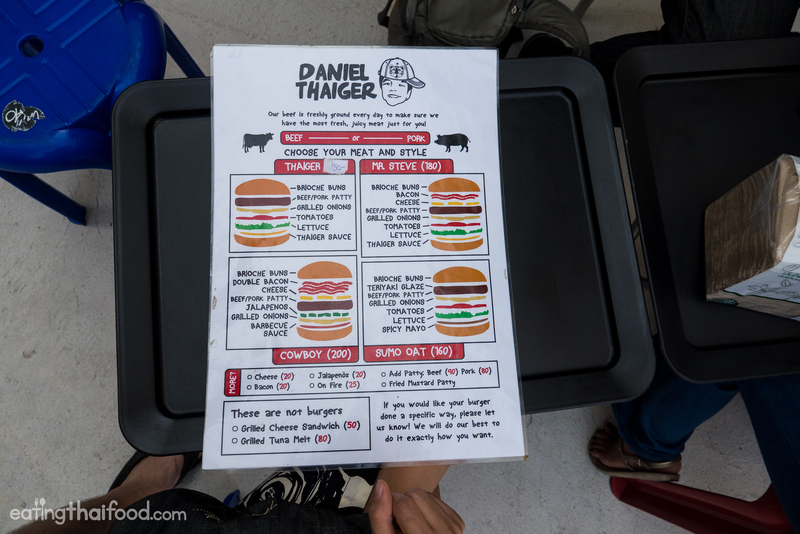 Again, Daniel Thaiger explains on their menu that they always use fresh beef, and that’s one of the main reasons why they have built such a devout burger following in Bangkok. And the beef is truly spectacular. It was so juicy and tender, and the little morsels of minced beef melted in my mouth together with the sauce and cheese. All the ingredients that make up a burger at Daniel Thaiger are good, but the actual beef burger patty is what really makes it one of the best burgers in Bangkok and something you want to keep coming back for. 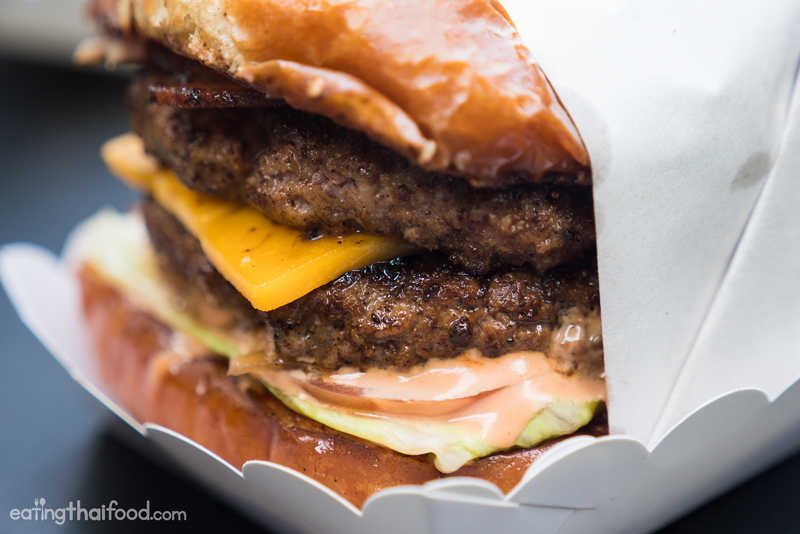 When it comes to burgers in Bangkok, Daniel Thaiger is one of the greatest gifts in the city. Their burgers are classic, not trying to overdo it on style or fanciness, but just all around fantastic burgers. All the components of their burgers are good, but for me it’s the beef that really makes it amazing. 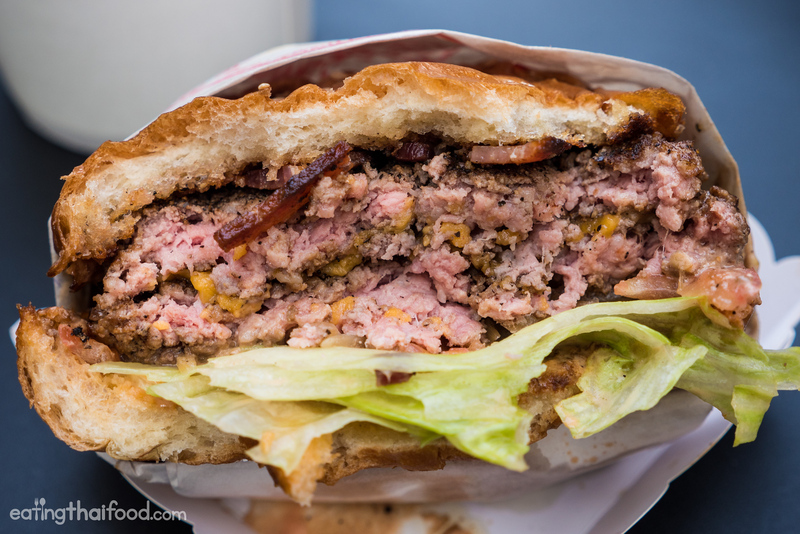 Additionally the Daniel Thaiger food truck is just a nice friendly place that attracts a great mix of people who are all ready to enjoy an incredibly satisfying burger. The single burger on its own is pretty good size, so I wouldn’t say that ordering an extra patty is mandatory… but then again, I can tell you, it’s definitely worth it. How to get to Daniel Thaiger: The Daniel Thaiger food truck sets up right along Sukhumvit Soi 30/1, just about 20 meters from Sukhumvit road. You can either take the BTS to Thong Lo or Phrom Phong station (I think it’s exactly in the middle), and it’s about a 10 minute walk from either station. The short walk only is great for building your anticipation! This is insane. 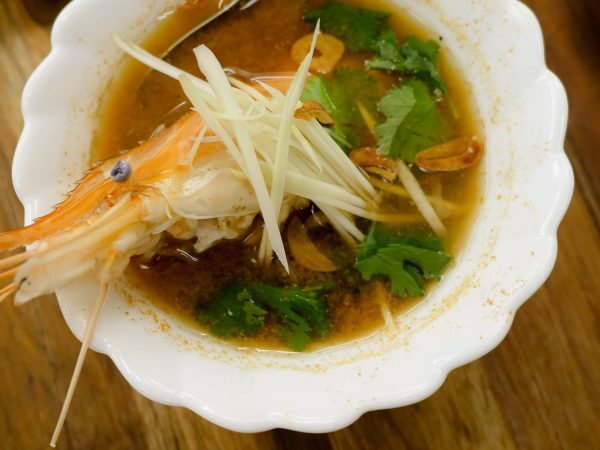 One Western food I would definitely visit Asian-Street-Food-Capital-BKK to try out!! Customer service was lousy. I live nearby, bought and paid for a burger, was told 15 – 20 mins for pickup. 30 mins later, the burger was not yet even on the grill and the staff could not care less. I was not given a time as to when it would be ready, I could wait no longer as I had an international telcon booking so I was grudgingly given my money back. What I think happened was that they gave priority to Uber bookings. I’ll pass the level of service at Daniel Thaiger outlets on to my friends..
Hey Mark i am Chaitanya from India, i also like to travel and eat foods like you and i had vsited your country Thailand on May this year. The Thai food was amazing. hai Mark..Thanks for information..keep smiling.. Thanks for the heads up Mark. I live in Yunnan in southern China, so we get to BKK often. 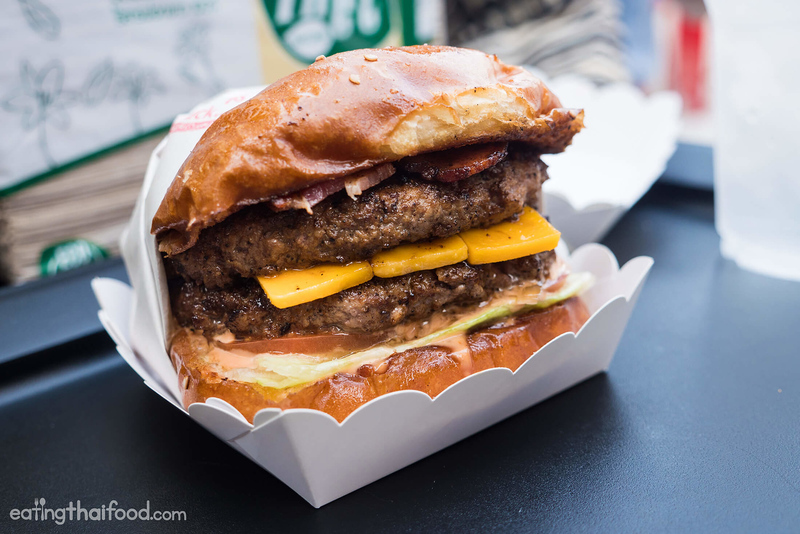 I can’t wait to tear one of these burgers up the next time I’m in Bangkok. In 24 hours, I board a plane for BKK, but I will be headed to Hua Hin, so no time to stop and eat a burger. Any suggestions for Hua Hin? Hey Mark I truly enjoy your your vglogs. 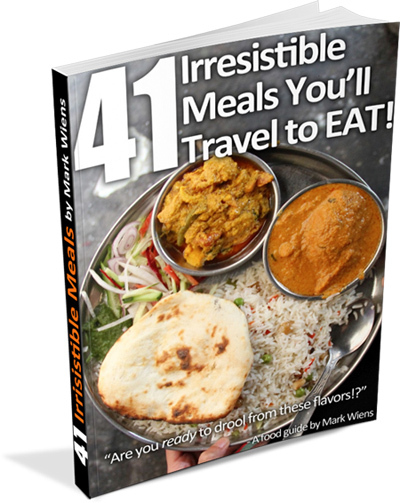 When will you come to Texas and try our cuisine? Thank you Juan. Not sure yet, but I would love to visit Texas! 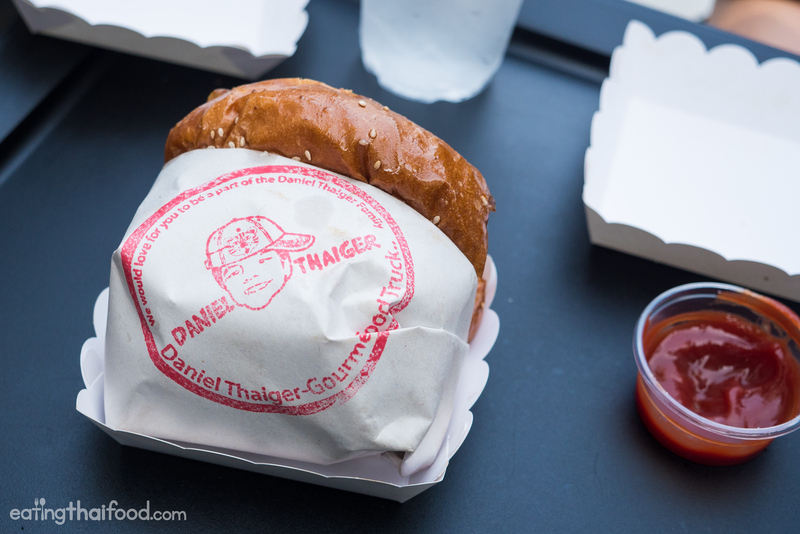 There is a brick and mortar Daniel Thaiger on Sukhumvit Soi 11 where the street turns. near the Le Phenix hotel and Holiday inn express. Just walk down Soi 11 from the Nana BTS you will find it on the right side of the street before the 7/11 on the corner. Best burger Ive ever had ANYWHERE! They also have a nice selection of imported craft beer. You can order on the street or go in and sit. Very cool atmosphere inside, not to mention the AC! Hey Andrew, thanks for the insights about Daniel Thaiger, I still haven’t yet made it to the other location. It is an amazing burger! I have been in Bangkok for 9 years and tried burgers from all over, in my opinion these are the best in the city and I regularly hit the van after training. Awesome to hear that Chris, making me crave a burger right now! The burgers at Game Over (Thong Lo) are also made from Daniel Thaiger, and it’s a really cool place. Don’t need to chase the food truck constantly. Thanks Tobias, are they still open there? I think this location will be a permanent place. Hi Bill, thanks for reading. Yah, maybe a little bit more melted could have been even better. I think the beef here is what really stood out the most for me. Worchestershire sauce again. Why do almost all (well all that I can think of) Thai burger places feel that Worschestershire sauce is necessary? It only serves to hide the delicious beefiness of the burger. If the beef is so damn great you wouldn’t want them to cover it up with Worchestershire sauce. Oh how I loathe that stuff!